The Royal Navy’s most famous action of March 1915 was its unsuccessful attempt to force the Dardanelles. Its most successful one was the sinking of the German light cruiser SMS Dresden on 14 March. However, in March 1915, as with every month of the war, it was involved in many other activities across the world. The Ottoman Empire’s largest Mediterranean port, Smyrna (now Izmir), was bombarded on 5 March in an operation similar to the attack on the Dardanelles. The intention was to prevent it being used as a submarine base. The attacking force consisted of the battleships HMS Swiftsure and Triumph, detached from the Dardanelles, the cruiser HMS Euryalus (Vice Admiral Sir Richard Peirse’s flagship), the Russian cruiser Askold, the seaplane carrier Aenne Rickmers and minesweepers. Smyrna was defended by a battery of seven 9.4 inch guns and another of four 6 inch guns, plus minefields that were protected by light guns and searchlights. 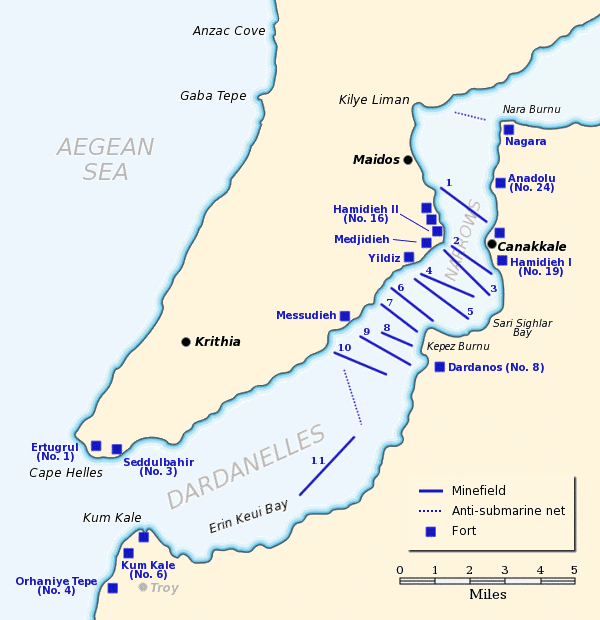 The action began on 5 March and soon became a smaller version of the Dardanelles. The minefields prevented the big ships from getting close enough to destroy the guns which stopped the minesweepers from clearing the minefields. An attempt was made to persuade the local ruler, the Vali of Smyrna, to come to terms. He appeared to agree, but it was unclear whether or not the military would obey him, especially after British ships flying flags of truce were fired on. The attack was called off on 15 March because the battleships were recalled to the Dardanelles. Ironically, Smyrna could not be used as a submarine base because the Ottomans blocked it by scuttling five ships in order to defend it against the attack. In Africa the RN was engaged on both coasts. The United Kingdom’s main interest in the Cameroons was in capturing the wireless station and port of Duala, which might have been used to support cruiser operations. The French were more interested in obtaining territory. Duala was taken by a river based operation on 27 September 1914, during which the gunboat HMS Dwarf sank the German cutter Nachtigal. However, the Germans had not retreated far, meaning that a further advance was needed in order to make it secure. In March 1915 the naval force operating off the Cameroons and along its rivers consisted of the cruiser HMS Challenger, HMS Dwarf, the French cruiser Pothau and about 20 smaller craft. In late April Challenger was relieved by the cruiser HMS Astraea and the force strengthened by the cruiser HMS Sirius and the sloop HMS Rinaldo. Until the British victory at the Falkland Islands on 8 December 1914 RN forces in South Africa had to be kept concentrated. South African troops were convoyed by sea to the British enclave at Walvis Bay on 25 December. By March the most important task for the RN’s South African station was the blockade of German East Africa (now Tanzania). The light cruiser SMS Königsberg was by then trapped in the Rufiji River. The only German commerce raider at liberty in March was the armed merchant cruiser SMS Kronprinz Wilhelm, which would intern herself in Newport News on 8 April. However, the British did not learn until around 19 March the light cruiser SMS Karlsruhe had been destroyed by an accidental explosion on 4 November 1914. By March 1915 the main German threat to Allied commerce was from U-boats. Germany had declared that it would conduct unrestricted submarine warfare from 18 February. In February German U-boats sank nine Allied merchant ships with a total tonnage of 22,784 tons, including two of 4,286 tons on 15 February. Two (11,228 tons) were damaged. In March 30 ships (79,369 tons) were sunk or captured by German U-boats, with six (22,300 tons) being damaged. One of the ships in March sunk was the 5,948 tom armed merchant cruiser HMS Bayano. These losses, although higher than previously inflicted by U-boats, were not huge because of the relatively small number of U-boats that Germany then possessed. It had 23 operational on 22 February, plus seven newly completed boats that were under sea trials. The need to refit, repair and resupply boats meant that there was an average of 5.6 and a maximum of 12 boats at sea on any one day between March and May 1915. The RN, like all navies lacked effective anti-submarine countermeasures in March 1915. Three U-boats were lost that month: U8 was trapped in nets and scuttled whilst under gunfire from the destroyers HMS Gurkha and Maori on 4 March; U12 was rammed by the destroyer HMS Ariel on 10 March; and U29 was being rammed by the battleship HMS Dreadnought on 18 March. U29 remains the only submarine to have ever been sunk by a battleship. She was lost with all hands, including her captain, Kapitänleutnant Otto Weddigen. He had previously captained U9 when she sank three British cruisers on 22 September 1914 and another on 15 October. The Admiralty issued orders that merchant ships that sighted a surfaced U-boat should head towards it in order to force it to dive. On 28 March Captain Charles Fryatt of the Great Eastern Railway packet Brussels escaped from U33 by this tactic. British naval operations continued throughout the world, including blockading Germany, supplying the Western Front, patrolling and minesweeping. On 24 March aircraft of the Royal Naval Air Service attempted to bomb the dockyards at Antwerp, where small U-boats of the UB coastal type were being assembled. Some aircraft had to abort because of technical problems and weather, but two, piloted by Squadron Commander I.T. Courtney and Flight-Lieutenant H. Rosher, bombed the target. This link names all British Empire sailors and marines who died in March 1915, whether from enemy action, illness or accident. The largest number were killed in the Dardanelles, followed by the crew of HMS Bayano. Most others died in the UK or home waters, but some died in Australia and Canada. Twelve were lost when the trawler Lord Airedale, taken into service as a minesweeper, foundered in a storm off the east coast of England on 18 March. The sea was dangerous, even when not undertaking dangerous war work such as minesweeping. J. S. Corbett, H. Newbolt, Naval Operations, 5 vols. (London: HMSO, 1938). vol. ii, pp. 195-200. P. G. Halpern, A Naval History of World War I (London: UCL Press, 1994), p. 114. H. Strachan, The First World War: Vol. 1, to Arms (Oxford: Oxford University Press, 2001), pp. 519-23. Corbett, Newbolt, Naval. vol. ii, pp. 281-84. Ibid. footnote 1, p. 240. W. A. Raleigh, H. A. Jones, The War in the Air: Being the Story of the Part Played in the Great War by the Royal Air Force, 7 vols. (Oxford: Clarendon Press, 1922). vol. ii, pp. 343-44. From late 1914 onwards there was a dispute over British military strategy. The ‘Westerners’, including most generals, saw the Western Front as the decisive theatre. However, the ‘Easterners’, mostly politicians or admirals, thought that stalemate on the Western Front could not be broken, so wanted to launch an offensive elsewhere, probably the Near East, where they hoped to knock the Ottoman Empire out of the war and persuade Italy and neutral Balkan countries to join the Allies. Admiral Lord Fisher, the First Sea Lord proposed a number of schemes, including attacks on Zeebrugge. Borkum, Cuxhaven and the Baltic. On 3 January 1915 he gave Winston Churchill, the First Lord and thus his political superior, a plan that he and Lieutenant-Colonel Maurice Hankey, Secretary to the War Council, had devised for a major offensive against the Ottoman Empire. It involved attacks on Gallipoli and Istanbul: although then referred to as Constantinople in English, it has officially been called Istanbul since the Turks captured it in 1453. It looked good on paper, but was impractical. It needed far more British troops than would have been released from France and assumed that Bulgaria and Greece, strong rivals and both neutral, would enter the war on the Allied side and co-operate. The day before, Grand Duke Nicholas of Russia had requested that the British carry out a ‘demonstration’ in order to distract the Ottomans who were attacking in the Caucasus; Lord Kitchener, the Secretary of State for War, told Churchill that the only place where such an action might succeed was the Dardanelles, but there were no troops available. By 4 January the Russians had forced the Ottomans to retreat from Sarikamish, but the British, apparently unaware of this, continued to look for ways to help their ally against the Ottomans. Churchill was attracted by part of Fisher’s plan, which was for an attack by old battleships on the Dardanelles. He ignored Fisher’s requirement for the warships to be accompanied by troops, who would take the high ground along the Gallipoli side of the Dardanelles. The Royal Navy had always argued that warships could rarely attack forts successfully without support from land forces. Lord Nelson had argued that ‘any sailor who attacked a fort was a fool,’ and the former First Sea Lord Sir Arthur Wilson was the only senior officer of the early twentieth century who disagreed. On 3 November 1914 and Anglo-French squadron had bombarded the outer forts of the Dardanelles from 13,000 yards, damaging one of them. This led some to think that it might be possible to destroy them from a range at which they could not reply. However, it also alerted the Ottomans to the fact that they might be attacked. After the war, this was described as an ‘unforgivable error’ by Admiral Sir John Jellicoe and ‘an act of sheer lunacy’ by Admiral Sir Reginald Bacon. Balfour was one of the few that favoured an attack by only ships. Churchill later admitted that he would not have gone ahead with a naval only attack had he known that 80-100,000 troops would be available by May. However, in January Kitchener had said that 150,000 men would be needed and few could be spared. Arthur Marder argues that in the end the ‘famed Churchillian impetuosity, eloquence and doggedness carried the day.’ Churchill argued, on the basis of the performance of German artillery against Belgian forts in 1914, that the Ottoman forts would not be able to resist the fire from 12 and 15 inch battleship guns. However, the Germans had forward observers to correct their fire, whilst the Allied ships would be firing on concealed positions from several miles away with no observers on shore. The Germans were also using howitzers with a higher angle of fire than battleship guns. It had been hoped that seaplanes could act as spotters, but they found it difficult to take off unless the sea was very calm and could not fly high enough to safely and successfully spot the fire. The sea also affected the stability of the ships as gun platforms, another disadvantage compared with shore guns. The risk from minefield was also ignored or under-estimated. The Ottoman shore batteries only needed to sink or force away the minesweepers, which were trawlers manned by peacetime fishermen who were members of the Royal Naval Reserve, to prevent the battleships from continuing. Even if the battle fleet did manage to get past all the gun batteries, it was not clear what it was then supposed to do. It was apparently assumed that its appearance at Istanbul would cause a revolution, even though it would not have been accompanied by any land forces to occupy the city and its communications would be open to attack by any remaining forts. Churchill assumed that the old battleships were of little value in the North Sea, so could be risked in this operation. However, before the Battle of Jutland, most British admirals thought that a major fleet action might cause such heavy losses amongst the dreadnoughts of both sides that the RN’s vast superiority in pre-dreadnought battleships would then become decisive. The next entry in this series will describe the actual attack. A. J. Marder, From the Dreadnought to Scapa Flow; the Royal Navy in the Fisher Era, 1904-1919, 5 vols. (London: Oxford University Press, 1961-70). vol. ii, p. 202. T. Travers, Gallipoli, 1915 (Stroud: Tempus, 2001), p. 20. Marder, From. vol. ii, p. 204. Marder, From. vol. ii, pp. 204-5. Quoted in Ibid., p. 200. Quoted in Ibid., p. 201. Quoted in R. A. Hough, The Great War at Sea, 1914-1918 (Oxford: Oxford University Press, 1983), p. 153. Quoted in Hough, Great, p. 152. The War of 1812 between the United Kingdom and the United States of America, which began when the USA declared war on 18 June 1812, formally ended on 18 February 1815 when the US Senate unanimously ratified the Treaty of Ghent, which had been signed on 24 December 1814. It was a war without a clear winner, but it did have a clear loser: the Native Americans. The British initially demanded at the peace conference that a Native American buffer state be set up in the Ohio/Wisconsin area, but were not in strong enough position to insist on this proposal when the USA rejected it, so quickly dropped the idea. Most, although not all Native Americans, backed the UK in the war. The Creeks also fought and lost a war with the USA in 1813-14. The Native Americans played a significant role in several British victories, including Detroit and Queenston. However, the death of their leader Tecumseh at the Thames was a severe blow. The British inability to establish a Native American state left them open to US expansion westwards after the war. The USA had originally gone to war because the UK’s economic war with Napoleonic France was producing British interference with US trade and because the Royal Navy impressed [often shortened to press] US sailors into service. Under British law, the RN was entitle to impress, or conscript, British merchant sailors. These included men who it considered to be British, but who were US citizens in American eyes. All these causes disappeared when Napoleon was forced to abdicate in April 1814, but fighting in North America continued. Negotiations between the belligerents began at Ghent in August 1814. The victory of the Anglo-Canadian army at Lundy’s Lane on 25 July had by then ended the threat of a US invasion of Canada. The US naval victory at Lake Champlain on 11 September ended the threat of a British invasion of the USA. Consequently, although both countries held some enemy territory, neither had enough of an advantage to affect the negotiations. The negotiations continued for several months. Eventually, war weariness, the stalemate along the frontier and the removal of the original American grievances by the end of the UK’s war with France led to the negotiators agreeing terms on 24 December: little changed from the pre-war situation. They still had to be ratified by the respective governments: geography meant that the UK did so very quickly, but it took until February before the terms reached Washington. Operations continued until then. The British control of the seas meant that they could launch a series of amphibious assaults, including one that resulted in the burning of the White House and an unsuccessful attack on Baltimore and another that led to the American victory at New Orleans. Many Americans heard of the end of the war soon after they learnt of their victory at New Orleans, so it was natural for them to assume that New Orleans had won the war for the USA, but this was not the case. The British were in the early stages of an attack on Mobile when they learnt of the end of the war. It took some time until all the warships at sea learnt that a peace treaty had been signed, so some naval actions took place after the official end of the war. 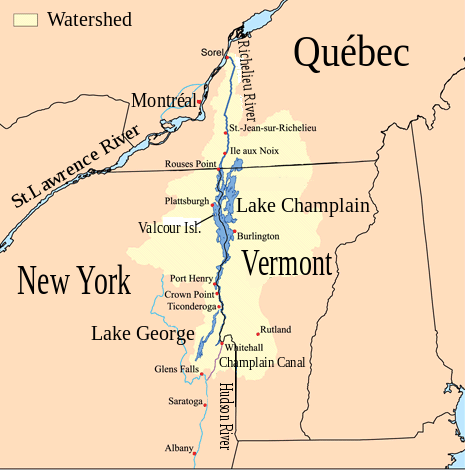 If there was a decisive American victory of the war it was Lake Champlain. It prevented the British from capturing American territory, which would have given them a bargaining chip that might have forced the US to accept their demand for a Native American buffer state. Although the war was a draw, a draw was enough for the USA to firmly establish itself as an independent nation and for Canada to remain part of the British Empire and thus later become an independent nation. The war gave Canada a sense of national identity. The United States Navy was a relative gainer, since it put up a better performance than the United States Army and a established a tradition of victory. However, apart from Lake Champlain, the major naval actions of the war were won by the side that should have won on paper. The US squadron at Lake Erie was much stronger than the British one. The USS Constitution captured HMS Guerriere and HMS Java in separate actions, whilst the USS United States took HMS Macedonian. In each case the US ship was more powerful. The apparently most evenly balanced frigate action was when HMS Shannon captured the USS Chesapeake, which was similar in size and firepower. However, Philip Broke had captained the British ship for seven years, training her crew to a high level of efficiency. Captain James Lawrence had been in command of the American ship for only 12 days. The other two American frigates to be captured by the British, the USS Essex and President, were both outnumbered. The sloop USS Wasp captured the roughly equal brig HMS Frolic, but was then forced to surrender to the much stronger HMS Poictiers. Tagged as Canada, draw, Native Americans, peace, Treaty of Ghent, United Kingdom, United States, War of 1812, who lost?, who won?